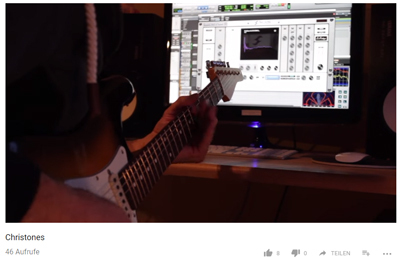 I have struggled in the past to find really musical and excellent Impulse Responses (IRs), that fit into a mix and reflect my experiences with miced guitar cabinets. So I decided to make my own ones. After an overwhelming positive response from players who actually tested them, I decided to offer them for sale. Yes, I truly think they are among the best. From a musician to musicians. My IRs are available in the tur-format (as stated in the Shop some packages now include 96kHz wave files as well), which means they can be mainly used with Two Notes gear such as the Torpedo Live, Studio, C.A.B. and the WoS /Wall of Sound software plugin. Here is a comparison of the 1973 Marshall, Rivera and CAA 4x12 cabs with hard left and right panned rhythm tracks using several IRs of the packages to show the different flavours these IRs can deliver. Definatly suited for Rock and Metal. 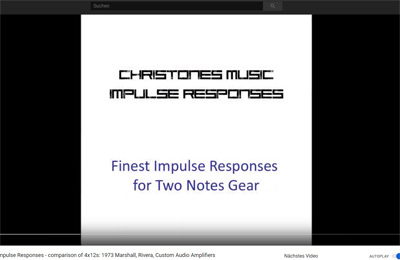 Check out Andy Susemihl giving a few of my Impulse Responses a test drive. Andy is a gifted player, songwriter and producer. Check also out his new record Evelation. He definatly is one of the best out there. 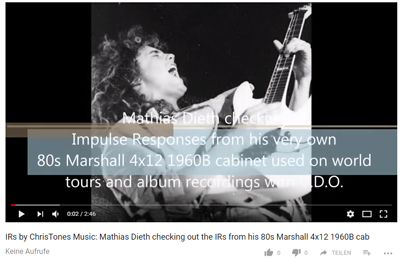 Check out Mathias Dieth playing my Impulse Responses of his very own 80s Marshall 4x12 1960B cabinet. That particluar cabinet has a history and was used on tours around the world as well as on U.D.O.’s studio recordings for Animal House, Mean Machine, Faceless Word and Timebomb. The availabe packages come with a great collection of single IRs, captured with the finest microphones (such as Unidyne SM57, Shure SM57, Heil PR20, Audix I5, Royer R121, Shure KSM32) and with one of the best preamps for guitar recording, the Chandler TG-2, for EUR 9,99 for a complete package. I hope you enjoy and they make your sound better and easier to control. PS: Special thanks to Morris, Mathias, Stephan, OJ, Christoph, Max-Michael and Markus for making these truly great Impulse Responses possible. Please notice: All product names used in this shop are trademarks of their respective owners, which are in no way associated or affiliated with CTM ChrisTones Music / Christian Tolle. These trademarks of other manufacturers are used only to identify the products of those manufacturers whose sounds were captured during the creation of the impulse responses.